It looks like Nikon is closing to announcing the Nikon Z1, an entry-level full-frame competitor to the Canon EOS RP. 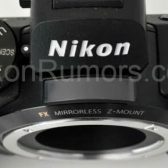 Nikon Rumors posted what looks to be a legitimate leaked image of the new camera body. No specifications have been mentioned as of yet. Can they meet the same price point that Canon hit with the EOS RP? Seems like Canon did something right this time - could this be possible? Or what's the reason to "copy" Canon? So, the price war for FF is on! That's certainly good news for photographers, We need a competition for cost of lenses next.